The POE-171 sends Ethernet digital data with DC 56V power over the twisted pair cables and operates as an IEEE 802.3at Gigabit High Power over Ethernet Injector, and it supports a distance to a PoE device up to 100 meters. The POE-171 utilizes a cabling standard as IEEE 802.3at/af PoE. Instead of delivering power over 2-pair twisted UTP – be it End-span (Pin 1,2,3 and 6) or Mid-span (Pin 4,5,7 and 8), The unit has the ability to source a maximum of 60 watts of power by utilizing all four pairs of the Cat5e/6 Ethernet cable. Two PSE controllers can be utilized used to power data and spare pairs. The easy-to-install unit features Plug and Play, which makes troubleshooting for users even more efficient. The unit showcases a durable compact housing case and features a 52~56V DC input power jacket on the unit’s right side. The unit also includes power LED and two PoE LEDs (802.3at End-span and 802.3at Mid-span) at the unit’s top side. In addition, the POE-171 features two RJ-45 ports, a Ethernet and Ethernet+DC port, at the side of the unit’s panel. 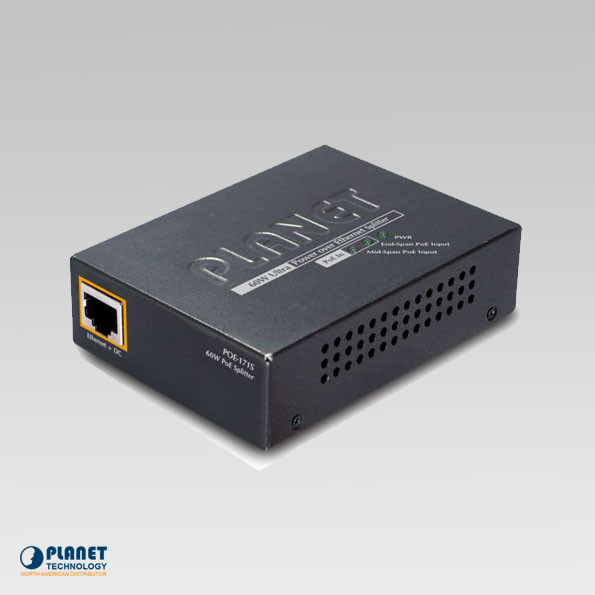 The POE-171 features high speed network connection and a additional 60-watt ultra power PoE injector. The unit does not require software configuration. 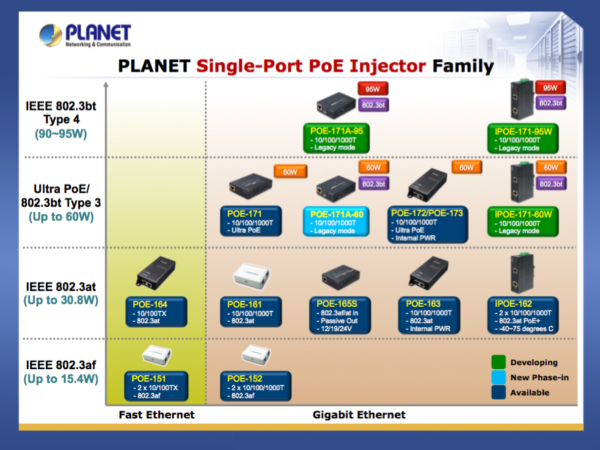 The ultra PoE injector with the unit is the perfect solution that allows network devices that feature a demand for high power to be powered through a RJ-45 Port interface. The unit does not require additional cabling or dedicated power outlets. Power Consumption 65 watts max.